Just the title sounds positive to me. With the weather channel forecasting temperatures in the single digits tonight, it doesnt seem possible that by the time this article makes it into Grange homes across our State and Country, it will be time for Spring. 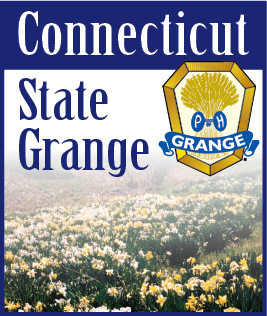 After being cooped up during our recent storms, spring means it is time to set out with renewed energy to promote the Grange in a positive way. Have an extra half hour? Why not stop at your hall and pull a few weeds. Or, if your dahlia bulbs have multiplied like ours have, why not plant some at your Grange Hall. The way the town sees our halls is a kind of advertising. It can say, See - We are still here and were still active! If every member could donate just a half hour, what a difference we could make in the Grange image. Has your Grange had a project lately that involves non-members. Take a picture. Send it to your local newspaper. When was the last time someone came up to you and said Did your Grange make the jewelry my Mom got for Christmas at the Convalescent Home? You people are wonderful. This is the best kind of advertising of all - Word of Mouth. It comes from the heart, and, it is FREE. As spring comes to our State, THINK POSITIVE. And, help create a positive image for our beloved Grange.